Stack-On is an all-American manufacturer based out Wauconda, IL. Since 1972, Stack-On has been making innovating new storage and security products for hobbyists, DIYers, mechanics and maintenance personnel around the world. Stack-On made a name for itself creating storage tools. Some of its most popular products include gun and archery cabinets, pistol racks, cabinet organizers, cable locks, rechargeable cordless dehumidifiers, moisture elimination systems, magnetic labels, electrical cord kits,and LED directional lights. Stack-On’s speciality is safes. In addition to normal consumer grade safes, they also make water and fire proof safes as well as portable pistol cases and secure jewelry containers. This slim, strong safe from Stack-On is perfect for storing long firearms like shotguns and rifles. It is one of the few safes that was built specifically for hunters that prefer to use gun scopes in mind. The GCB-909’s unique contoured shelving system can easily fit in awkward sized scoped weapons that are difficult to store in other types of safes. Slim size. 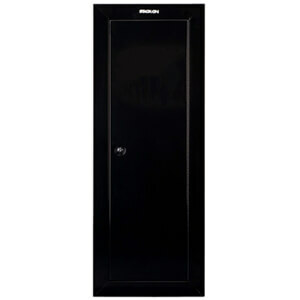 This long, slender safe’s dimensions (10 x 21 x 55 inches) make it ideal for people with crowded storage spaces. Lots of interior space. Even though it is slim, it can still hold up to 8 firearms. Great for long guns. It’s often hard to find a safe that is long enough to hold extra long firearms, but this one can easily accommodate 54” tall rifles or shotguns. Patented shelving system. This safe’s unique contoured shelves are designed to make it easier to store scoped guns. No scratches. The foam padded foundation is made to prevent nicks, dings and barrel grinding. Tamper proof hinges. Stack-On’s unique “piano” hinge system makes it impossible for thieves to pop open the door through the use of advanced safe cracking methods. Secure floor fasteners. Some crooks find their way into safes by exploiting weak floor fasteners, but the ones come with this safe are extra thick and secure. 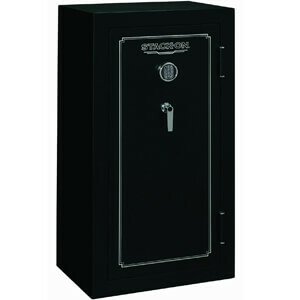 This safe’s walls are solid enough to defend against most types of break-ins, but other safes have thicker, tougher shells. 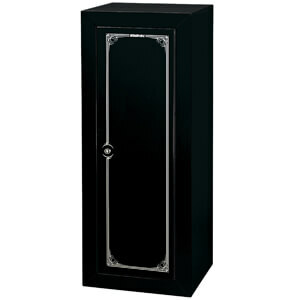 Click here to get the best price on this safe. This solid, medium sized 14 gun safe from Stack-On is ideal for hunters. If you have more than just a handful of rifles to stow away, give this product a hard look. Its one-of-a-kind patented contour shelves are perfect for storing scoped rifles don’t fit well inside other types of safes. Just the right size. If Stack-On’s 8 gun safe is too small for your needs, this slightly larger safe might be just what the doctor ordered. Lots of interior space. Even though this safe’s walls are thin compared to most other safes on the market, the benefit is that you get more room inside to work with. Perfect for scoped guns. If you need to store a scoped weapon, this safe’s contoured shelving system is just what you need. Classy silver accents. This elegant looking safe will blend in well with your pre-existing interior design scheme. Padded floorboards. The foam padded floorboard ensures that you will never discover grind marks or scratches on your gun barrel. Piano style hinges. The hinge is often a safe’s weakest point, but Stack-On’s piano hinge system guards against cracking attempts that target the side of the door. Impossible to budge. Safe-On’s extra heavy duty floor fasteners will keep this safe pinned firmly to the ground. This safe isn’t easy to break into by any means, but other safes on the market have thicker, stronger walls. Do you have an extra large collection of guns? If so, you might want to check out this 24 gun safe from Stack-On. It’s one of the largest safe in the Stack-On safe catalogue and can hold enough firearms to equip a small army. Like Stack-On’s other safes, this one is built with precision hunters in mind. There is no other safe on the market that is better for storing scoped rifles. Extra large capacity. Measuring in at 20 x 29.2 x 55 inches, this is the very largest safe produced by Stack-On. Advanced electronic locking system. Operational lights tell you when it’s time to replace the battery. Holds extra long guns. This safe can easily accommodate 54” tall weapons. Best shelving system for scoped guns. Stack-On has a patent on its unique shelves, which were designed to hold scoped rifles. Foam floorboard protection. The foam keeps your weapons from rattling around and scratching up the safe’s floors. Reinforced hinges. Stack-On’s special “piano” style hinge system makes it very difficult for intruders to attack the sides of the door. Extra sturdy floor fasteners. Some thieves will simply rock a safe back and forth until the floor fasteners pop off, but that sort of attack won’t work on this product. Though this safe’s storage system is absolutely top notch, its not-so-thick walls are vulnerable to some types of advanced safe cracking tools.